Thanks, Mail Carrier | Britax Blink Winner! I look at strollers the way that men looks at cars. When a high-quality stroller rolls by, I can't help but check out all of the features and think about the comfort that it could bring to my daughters or me. However, now that we have the Britax Blink, I know that we have the best of both worlds - compact, lightweight and easy to use while still giving my daughters a luxurious ride. As always, thanks to everyone who entered this great giveaway! Another great giveaway! 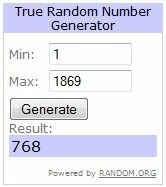 Congrats to your winner:) Have a great day. Congratulations, Jaime! I loves that stroller! I'm really going to have to bite the bullet and buy one!